Custom Family Reunion T-shirts have become a big hit over the past few years. It’s a cost effective way to bring unity amongst the family members and celebrate the day. When the day is over the family reunion t-shirts make a great keepsake to cherish that time and to look forward to next year. 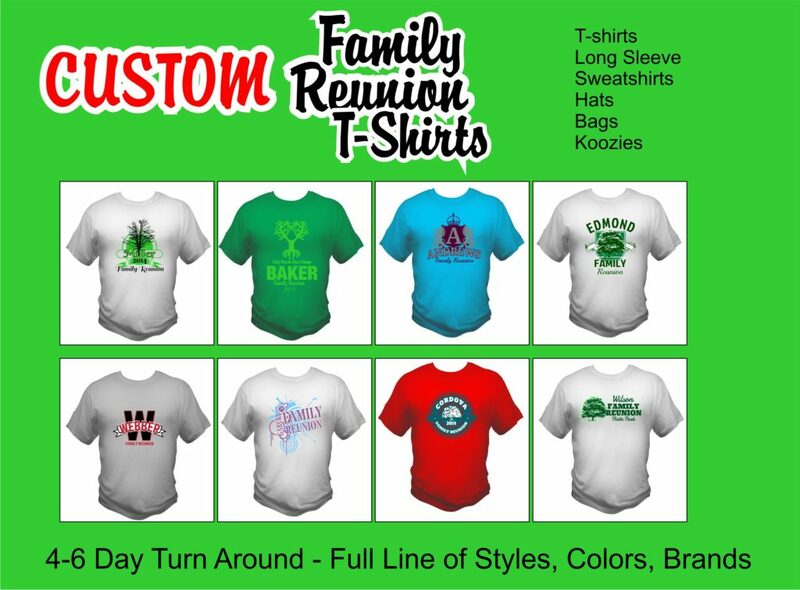 At Kirkwood Trading Company we print a lot of custom family reunion t-shirts for families all over the country. Aside from hearing the great stories about all of the wonderful families, we feel privileged to be a part of that day for your family. Often times new customers have no idea what’s involved in ordering their custom family reunion t-shirts. That isn’t a problem and we can help you through the process. Our best advice when it comes to ordering your family reunion t-shirts is to be as prepared as possible. We understand that is often times easier said than done but we’ll have questions that you can have answers to. First, in order to provide you with the best quality shirts and service we need to know a little information that makes things go smoother if you have these ahead of time. We need to know how many family reunion t-shirts you will need. A ballpark number is always fine to start. Next we need to know if you already have a design or if you want to choose one of our designs and have that customized for you. Lastly, we need to know where you want the design printed be it the front or the back or both of the shirts. All of this information will help us better serve you and allow us to give you the most accurate price possible. Once the specifics are out of the way we can talk time frame and dates as to when you need to have these shirts screen printed and ready. Our typical turn around time is 4-6 business days. Locally that is not a problem but if you are ordering your family reunion t-shirts from outside of Missouri and require shipping, there could be a few more days tacked onto that due to shipping. Before we ever print we’ll provide you with a digital proof to approve so there is never a mystery when your shirts are completed. Kirkwood Trading Company has been in the screen printing business for over 20 years. We understand the requirements that each unique job brings. We value our customers business and are here to help on any job no matter how big or small. Contact us with any questions or to place an order for your family reunion t-shirts and we’ll be happy to help.